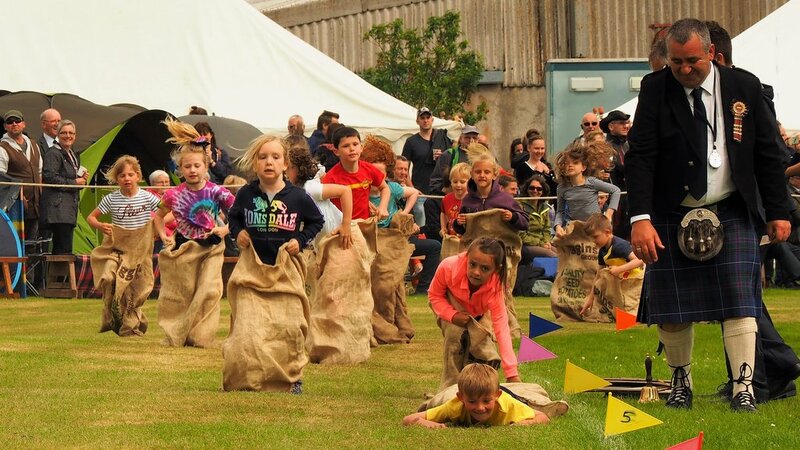 The origins of Highlands Games are believed to date back to the 4th or 5th century when competitive games for young men involving foot-racing, horse-racing and wrestling were encouraged. Games celebrations became a common feature of St Michael’s Day (September 29th) festivities while other racing and athletics contests sprang up at fairs on other holy days as well as at cattle fairs on the quarter days of the Scottish calendar. The Clan system that developed in the Highlands became a fertile ground for feats of strength among the young warriors and sporting contests were held at various times as well as the conclusion of military musters when they were called ‘wappinschaws’ The clans’ warriors used these events to test their physical prowess in the same way as modern soldiers engage in physical training. 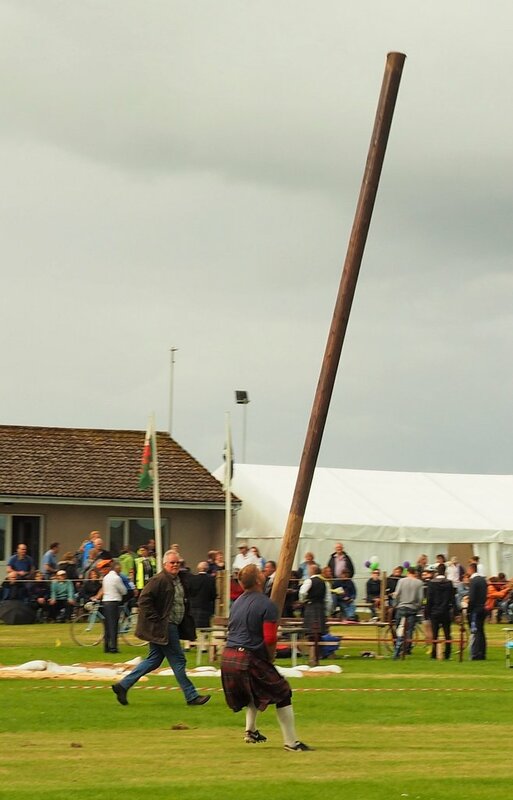 According to one source, it was at one such muster in 1574 that ‘tossing of ye barr’ (caber-tossing) first appeared on record. All of this came to an end after the Battle of Culloden in 1746 when the mainly Highland supporters of Bonnie Prince Charlie were beaten in the last battle on British soil and all Highlanders were banned from bearing arms, playing the bagpipes, speaking Gaelic, wearing tartan and gathering in groups. At the start of the 19th century, after the ban had been repealed, Highland Games became established annual events as part of the romanticisation of Highland culture amongst the British ruling class at the time. Queen Victoria attended her first Highland Games in 1848. When accounts from the games describe a programme of contests that are largely unchanged today: dancing, piping, lifting a heavy stone, throwing the hammer and running… Happily, the more specialised pursuit of ‘twisting the four legs off a cow for which a fat sheep is offered as a prize’ does not feature in the more civilised repertoire of the modern games. 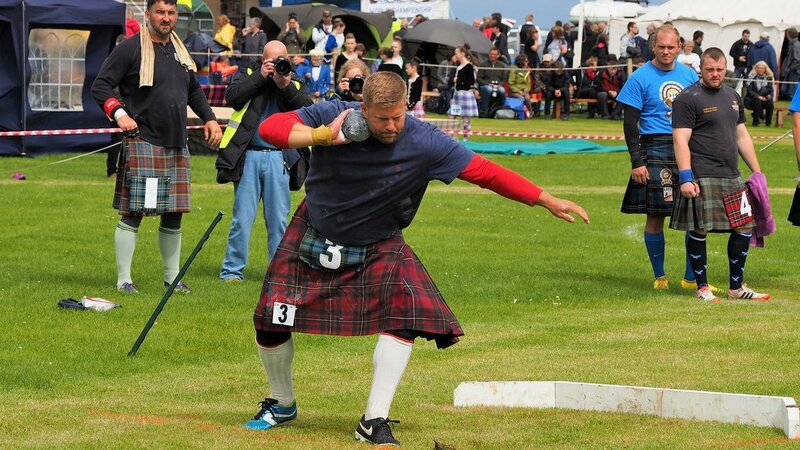 This usually comprises running and jumping, throwing stones or hammers, tugs-of-war, tossing the caber, as well as a variety of piping and dancing competitions. 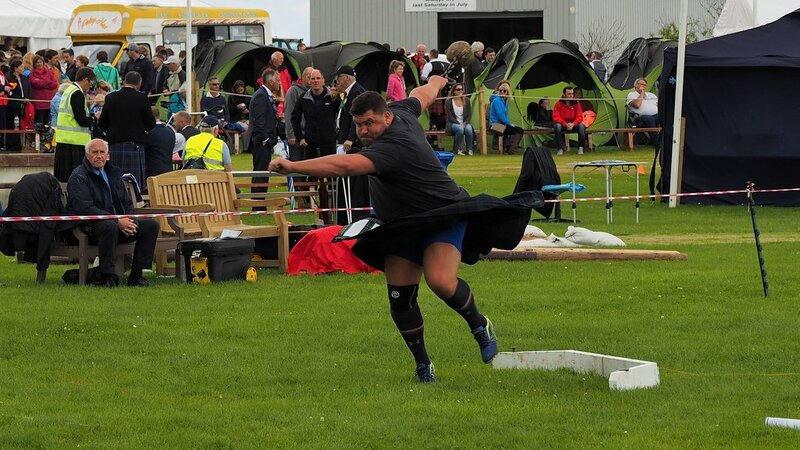 Our thanks to Erik Dams from The Netherlands for sharing his photographs taken at Halkirk Highland Games last month. A full programme of Scottish sporting events takes place each year and attracts crowds of up to 3,000. The prize money of over £20,000 is one of the best in Scotland and attracts both amateur and professional competitors from all over Scotland and overseas too. 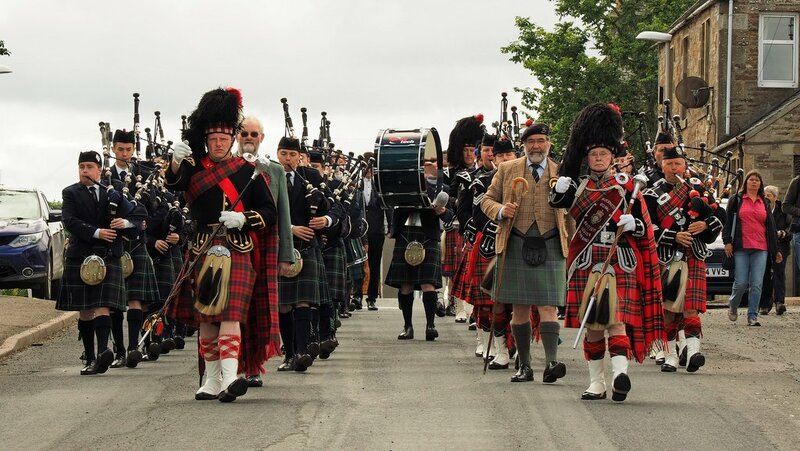 The Pipe Band leads the march from the town’s Bridge Street to the main arena where the Games are officially opened by the Games Chieftain, the Rt Hon Viscount Thurso. 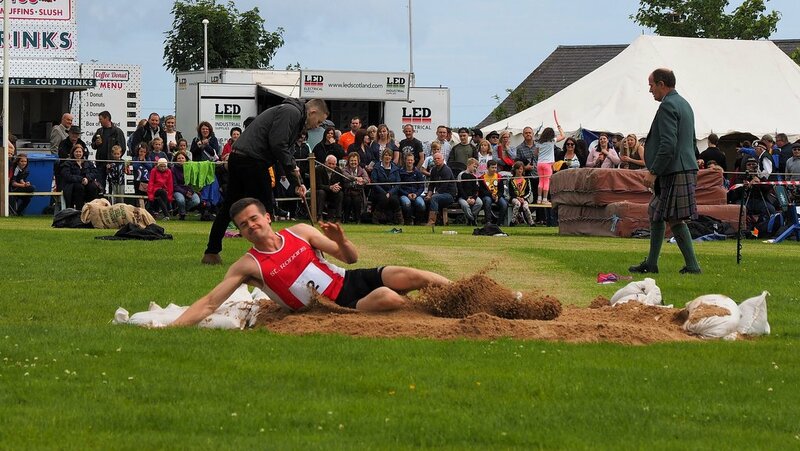 Nearly 100 events take place during the afternoon including track and field athletes, cyclists, clay pigeon shooters and traditional races for children. The highlight of the day are the ‘Heavies’ events, where the kilted strongmen toss massive wooden cabers, throw hammers and weights. There are pipers and Highland dancers too all competing for top prizes. Surrounding the arena are side stalls, charity stalls, a funfair and a marquee for food and drink. The evening is rounded off with a Grand Marquee Dance to a live band. 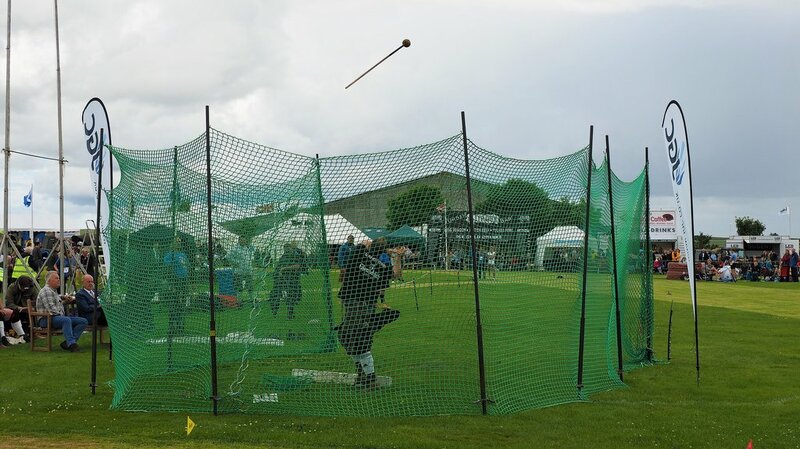 Highland Games take place throughout the summer all over Scotland, some are small community events and others like the Braemar Games attract more than 10,000 visitors. All are a great family day out.